Felino – Quebec’s Latest Race Car? 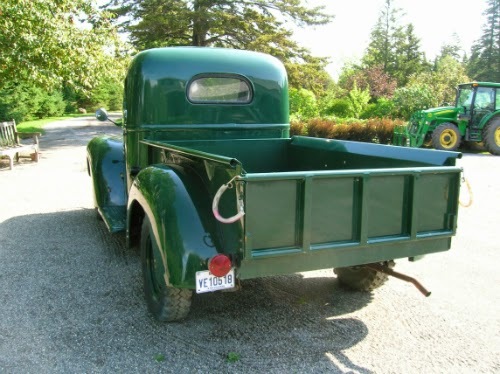 Quebec must be a province of car enthusiasts because they keep coming up with new and interesting Quebec-made vehicles. There’s the Allard J2X MKII (a remake of a classic British roadster), the HTT Pléthore LC750 supercar, and the Campagna V13R roadster trike. We might soon be able to add one more to that list, the Felino cB7. A prototype was revealed at the Montreal auto show last January, and word was that they would be doing final testing earlier this year with a view to a limited pre-production run late this year. It’s meant to be a track car, though they may eventually make a street legal version. Current specifications call for a 6.2 litre V8 putting out 525 hp at 6300 rpm, with a curb weight of only 1,135 kilograms. Yes, there’s carbon fibre involved. Check out the photos. And here’s a video, presumably taken about a year ago, showing the car tooling around the Circuit Gilles Villeneuve. But like so many dream cars, things seem to be running behind schedule. The press pack I got off the website was the one issued for the auto show and there seems to be no more current information. The specifications page says it will be updated in summer 2014. I checked the French version as well and it says the same thing. Guess we’ll have to wait and see. On the other hand, if you want to get in on the ground floor of a chance at a limited production car, they’re taking pre-orders now. When we were planning our road trip to Kegaska at the end of Highway 138, we thought we’d take a boat back from there. Turned out the price for us and the car to spend three days on the boat would have cost more than a Caribbean cruise, so we decided not to. 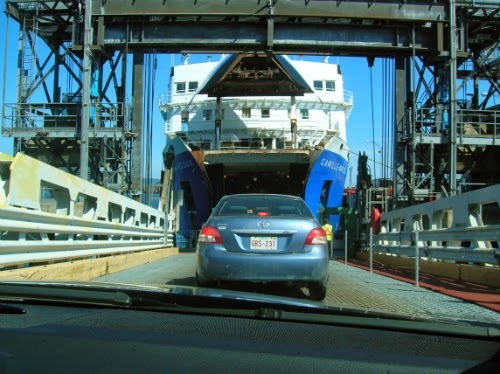 As a compromise, we figured we’d take the ferry from Baie-Comeau on the north shore to Matane on the south shore, a crossing of about two-and-a-half hours. If you’re thinking of doing something similar, here are some things to think about. It’s possible to make a reservation ahead of time through the Société des traversiers website. We did this and it was probably a good idea as, though we were travelling on a weekday in September, there were still lots of vehicles lined up to get on. 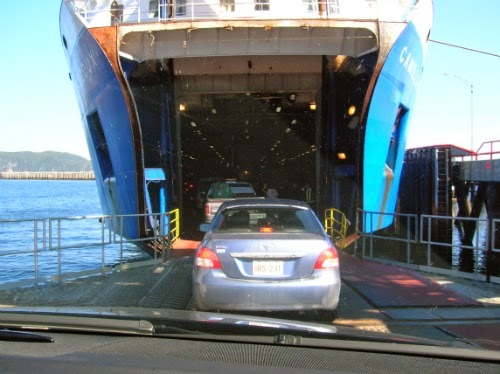 If you have mobility issues, or are worried about damage to your vehicle (not that we had any), you may want to avoid the ferry. They really pack you in there tightly. If you’re a passenger, be prepared to have to leave the vehicle before it’s parked and go upstairs. You will not be allowed to return to your vehicle until just prior to landing. I wasn’t expecting this and didn’t grab my jacket, which I could have used as it was very windy that day. My husband tried to text me once he was parked so we could find each other, but despite the fact we have the same network provider, I never got the message until the next day. You will have to re-enter your vehicle shortly before arrival. They had us wedged between a big RV on one side and a pickup on the other. The only way in to the car was through the back doors. No, I’m not kidding. My husband then had to climb into the front seat. Not fun. Having said that, we did enjoy the ferry ride. The boat is huge. It’s possible to go up on the top deck in the open air. There’s also a lower deck with lots of seats, a snack bar and gift shop, and even a couple of rooms with televisions, if you’re not interested in the view. 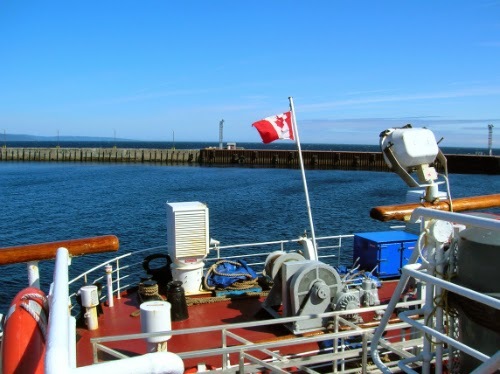 You don’t realize just how wide the St. Lawrence is until you’re out in the middle of it and can’t see either shore. Saw this on our way home from our road trip, at the jardins de métis near Matane, Quebec. Judging by its size, I’m guessing it’s a K-1 or perhaps a K-2. And while it looks to be in beautiful condition, it also looks like it’s been driven recently. That I like to see. 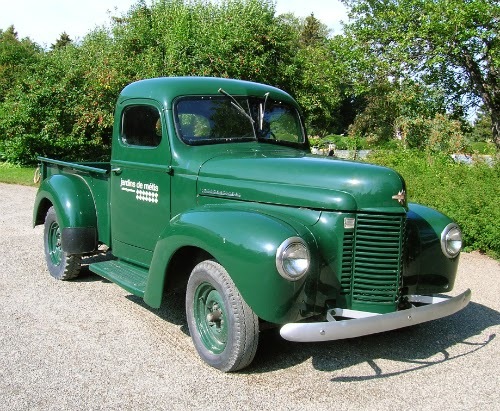 If you’re looking for IH information, check out this site by the Wisconsin Historical Society. Lots of documents and photographs. 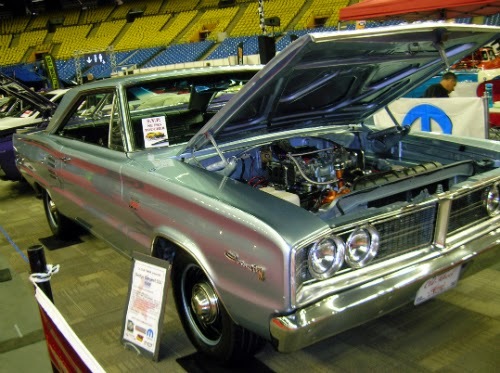 I’ll probably be doing more posts on Autorama, though I have a few other things I want to blog about first, but in the meantime, here’s a slideshow of several of the cars. If the video doesn’t play for you, you can also find it HERE. Did you manage to get to Autorama? I went Friday morning and had a great time looking at all the cars (and a few trucks). Possibly the nicest collection of North American cars I’ve seen under one roof. There were a few foreign makes as well, but the show floor was definitely dominated by American muscle. I’ll be putting up a few posts once I get my photos sorted, but in the meantime, check out this 1966 Dodge Coronet 500. I’d mentioned Autorama (running October 3-5 at the Olympic Stadium) in my listing for October car events, but thought some of you might like more information. So here’s a video commercial as a teaser (link HERE in case it doesn’t work). What can we expect? 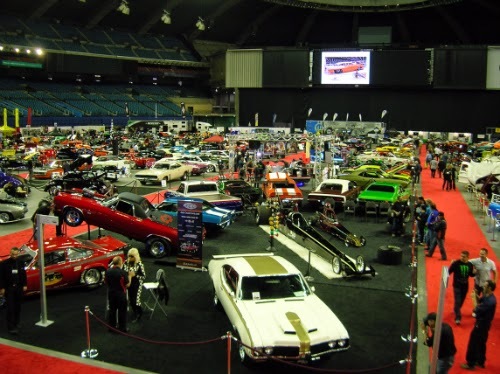 It’s billed as the largest indoor car show in Canada, so there will be lots to see. There will be 250+ cars to admire, including classics, exotics, and hot rods. I’d have had this post written already if I didn’t keep getting sidetracked by the slideshow of cars on their website. Special attractions include Jeff Gordon’s NASCAR, Andrew Ranger with his NASCAR, a car from the upcoming “The Fast and the Furious 7,” and a car from the “Back to the Future” franchise. In addition to the cars, there will be lots of exhibitors. Need more info? Here are the links to the Autorama webpage and Facebook page. 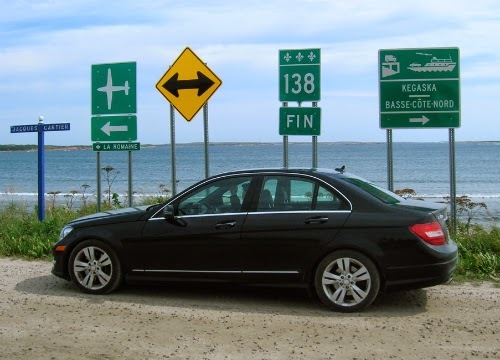 After a morning walk on the beach, it was time to take the car and drive out to the end of Highway 138. The first few kilometres out of Natashquan were good paved road, but the pavement ended around kilometre 16 and we were faced with gravel. Pretty decent gravel for the most part, but it did have a tendency to roll in places so we had to keep the speed down. That and we really didn’t want a rock coming through the windshield. There were very few other vehicles on the road, but we did run into a construction zone—like most of the ones on our trip, they were working on the culverts and bridges. In several places there were signs of a track beside the road, and we occasionally came across snowmobiles parked for the summer or neatly stacked wood. While there were some treed areas, the trees were small and scrubby. 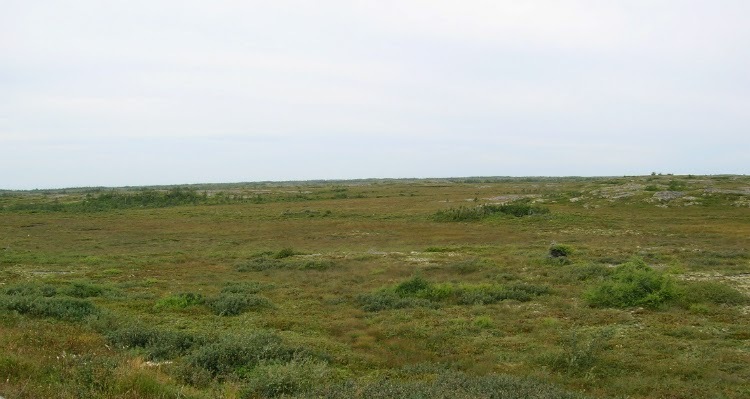 Much of what we saw was flat and looked like tundra, with small pools everywhere. Despite that, we saw no wildlife with the exception of a few birds. About an hour out of Natashquan, we reached Kegaska. It’s a small fishing village and apparently English speaking despite being deep in rural Quebec. 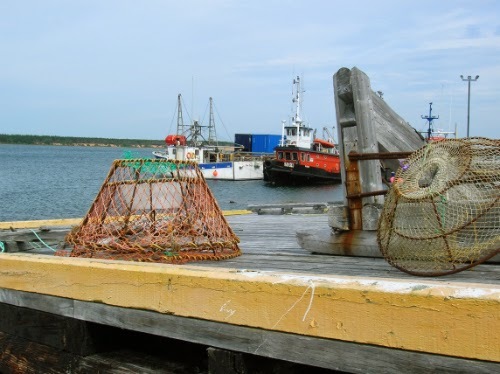 There’s a small working harbour with a large dock, as a supply boat comes in there regularly. We’d originally thought we might take the boat at least partway back home (three days on board), but the passage for our car and us would have cost more than all the rest of the trip. There’s also a combination restaurant/grocery store in town, but as we had brought our lunch with us, we didn’t check it out. The highway ends at the river, but it’s not actually the end of the road. There’s another road that runs along the river and apparently goes at least as far as the next village. Maybe someday. Bonus post for you today--I'll get back to the road trip next week. It’s lot 235 in an auction called Remembering Waylon (Waylon Jennings) being conducted by Guernsey’s in Phoenix this weekend. The bike itself is apparently a bit of a rarity as only 200 were built. Its having been owned by both Buddy Holly and Waylon Jennings adds to its value. You can read the whole story of the bike HERE, which I highly recommend, especially if you’re interested in the history of early rock ‘n’ roll. You can also find details of how to register there if you’re interested in bidding, and of course there are photos. They’re estimating it will go for anywhere between $100,000 and $1,000,000. The starting bid is set at $50,000. Admittedly not a lot, but the return of Autorama is great news. I hope to have more information/photos on that in the near future. I'm a freelance writer/editor who loves classic cars, easy recipes, travel, and a good book. Preferably all on the same weekend. Text copyright Kate Tompkins. Picture Window theme. Powered by Blogger.